Use the following outline to create your own ceremony to travel in the Spirit Vision to the Watchtower of Air, the subquadrant Water of Air, the square B of OY (V) V (U) B. STEP 1. 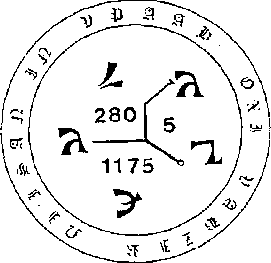 Consecrate a arde and enscribe it with the formulas of KAL and TOOG (see Formulas of Enochian Magick). 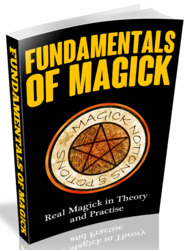 Execute the Banishing Rituals of the Pentagram and Hexagram. Stand with your Sword or Dagger and face East. Trace the yellow Banishing Pentagram and Hexagram of Air. Fill the room with the scent of galbanum or peppermint. "Behold," declares your God, "1 am a circle on whose hands stand Twelve Kingdoms. Six of these are seats of life, the rest are like sharp Sickles, or like the Horns of Death. Because of this, the creatures of Earth live or die only in my own hands, which sleep and then rise again." "In the beginning I made you stewards, and placed you in the twelve seats of governxnent. 1 gave every one of you an appropriate level of power over the 456 trae ages of time. My intent was that from the highest vessels and the fartherest corners of your governments, you might work my Power and pour clown the fires of life and multiply upon the earth. Thus you have become the skirts of justice and truth." ln the narre of this same God, lift yourselves up 1 say. Behold, His mercies flourish, and His Name. has become mighty arnong us. In Him we say, move, and descend. Apply yourselves to us as you would to partakers of His Secret Wisdom in your creation. The East is a House of Virgins who sing praises among the flames of the first glory. There the Lord opened his mouth, and they became 28 living dwellings wherein the strength of man rejoices.They are clothed with ornaments of brightness, and they work wonders on all creatures. Their kingdoms and continuance are like the Third and Fourth; strong towers and places of confort, the seats of merey and continuance. O you Servants of Mercy, move and appear! Sing praises to the Creator, and be mighty among us, so that this remembrance will give power, and our strength will grow strong in our Comforter. STEP 5. Enter your Body of Light and precede to the sub-quadrant Water of Air and then to the square of B in OYVB. Use the Opening of the Veil if necessary. STEP 6. You will see mostly Water here but with some Air clearly present. The combinations of Water and Air can be seen to act and react quickly together. The net result is the appearance of tremors or waves of agitation throughout the atmosphere. The Water and Air appear to be acting together to create all manner of forms. Designs and patterns of intricate shapes and delicate pues will appear and then dissolve again. STEP 7. You will see the goddess Isis in this regian in her capacity as the Fire of Solidification. She is the power behind the continual formation of shapes and colors in this square. The female sphinx here looks like a huge hawk with human arras and hands. The atmosphere of this square is charged with a strong feminine current. The net result is that the entice square vibrates with creative forces that sculpt and mold the elements into beautiful multa-colored designs but with little conscious planning or purpose. There seems to be no other purpose to the shape-shifting than the very desire to create forms. STEP 8. The Archangel here is ABOYV (Ah-boh-yeh-veh) whose number is 171, the number for the word APOPHRASZ ;meaning motion. The Angel is BOYV (Boh-yeh-veh) and his word is law here. If he speaks to you, it will be very hard to resist doing whatever he says. Use your Sword to maintain control if necessary. STEP 9. The demon in this square is ABO (Ah-boh) whose number is 41, the number for the words TOL (all) and EFAFAFE (vessels). ABO is male and is highly creative. His demonic nature is such that he is not definitive but instead seeks to create all manner of bodies. His impetuous desire to create new forms coupled with the power of solidilication given by Isis causes the chaotic and ceaseless creation of forms in this square. STEP 10. The astrological force working here is Taurus, and the Tarot influence is the Hierophant. This force adds to the constant precipitation into form that characterizes this square. STEP 11. After observing the square sufficiently, return to your physical body using the Closing of the Veil and then employ the Banishing Pentagram and Hexagram of Air. Be sure to record your experiences in your Magical Diary.